The use of cedar cladding is growing in popularity around the world and with good reason. 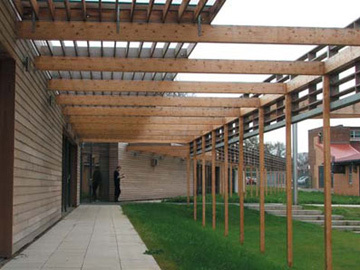 There are many advantages to using cedar cladding over using other materials to clad and protect a building. One obvious advantage of cedar cladding is that it is a natural product and a sustainable product. This means that if you use it you are protecting the environment and reducing the carbon footprint of your building. However, perhaps more important is the fact that cedar cladding is a very effective insulator, so you save money on heating and cooling bills and again help the environment. It is easy to install, requires very little maintenance and is relatively cheap to buy because, if installed well and looked after, it lasts for decades. Best of all is cedar cladding looks great on practically any type of building. You can stain it any colour, but it looks best when its natural reddish colour is left to fade naturally to a beautiful silvery grey. When buying cedar cladding it is important to buy the best quality you can afford. Doing so will ensure that your cladding lasts and continues to look good decades after you have installed it. You also need to make sure it is acclimatised before installation and is installed professionally. One of the best kinds of cladding uses cedar from Western Canada, it grows relatively slowly and has a beautiful deep red colour. Ask your timber supplier for cladding that has as few knots in it as possible it looks better and is more durable. Knots tend to fall out and create a weakness in the cladding because rain can get in, so the less knots your cladding has the better. You can find cedar cladding in local wood yards and some large builders' merchants or you can buy it on-line. Doing so gives you a bigger choice of companies to choose from. Take the time to visit and compare what each supplier has on offer before making a final decision. Timber Cladding sell high quality cedar cladding including pre-stained cladding.